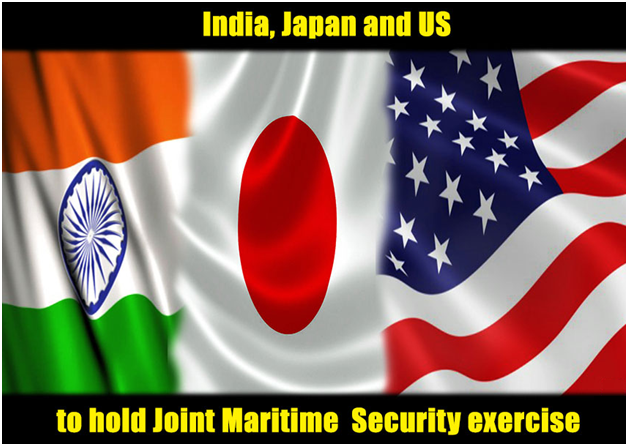 The Exercise will involve Naval ships, Aircraft and Personnel from the three countries in both ashore and at-sea training, off India’s eastern coast in the Bay of Bengal. The Training will focus on high-end war-fighting skill sets, surface and anti-submarine warfare, explosive ordinance disposal (EOD), helicopter operations, and visit board search and seizure (VBSS) operation. The Exercise would also include medical operation, maritime patrol and reconnaissance operations, damage control exercise and subjects matter expert and professional exchanges. "Malabar 2017" is the latest in a continuing series of exercises that has grown in scope and complexity over the years, to build upon and advance working relationship in collectively providing security stability in the Indo-Asia Pacific region, and help to increase the level of understanding between the sailors and interoperatability between the three Navies.